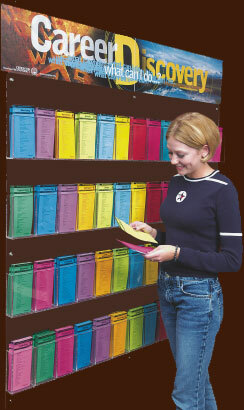 Beautiful display unit -- 4 clear plastic quarter panels measuring 33"x 24"
Individual cards may be ordered in packets of 50. This website and its contents are copyright © by CareerXplorer International, LLC. All Rights Reserved. Contact the webmaster with questions. Career Discovery...What Can I Do?™ is copyright ©2001 by Creighton University.